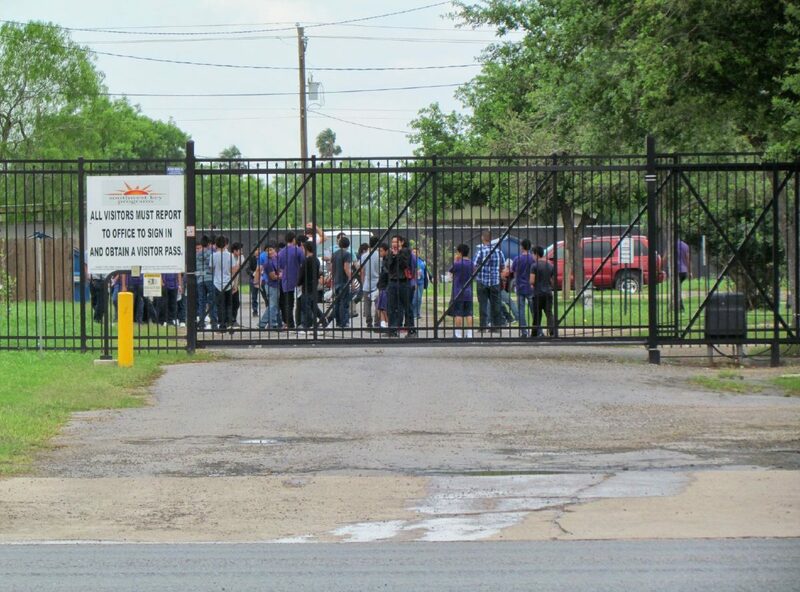 San Benito Southwest Key Program staff and young boys gather outside earlier this year. The young boys are those who have crossed illegally into the country and are now housed at the facility. SAN BENITO — The school district won’t be educating undocumented immigrant children at a federally-funded shelter here. Southwest Key Programs has canceled its agreement with the district after the Texas Education Agency announced it will stop allowing school districts to use state money to educate migrant children in federal detention. Southwest Key, an Austin-based nonprofit organization, uses federal funds to house undocumented immigrant children detained after crossing the U.S. border. “Because we received information that school districts cannot draw state funds to educate our students at Southwest Key, in the interest of both parties we are terminating our (agreement),” Salvador Cavazos, Southwest Key’s vice president for educational services, said Friday. Meanwhile, Southwest Key and the Harlingen school district are considering an option to allow the school district to continue teaching children housed in the nonprofit’s Combes shelter. “We are exploring a possible cost-savings agreement with Harlingen,” Cavazos, brother of Harlingen schools Superintendent Art Cavazos, said. In Harlingen, the school district entered into an agreement with Southwest Key to educate children in the small shelter in late 2013. In May, the San Benito school district entered into an agreement with Southwest Key to educate children housed in the nonprofit’s shelter at the site of the former Dolly Vinsant Memorial Hospital. By July, Superintendent Nate Carman had said the state would pay the district about $2.8 million a year to educate 480 children housed at the shelter. As part of a formula, the state pays the district $5,797 for every student it educates, Carman said. “Without the assurance of state funding, San Benito CISD is not in any position to expend district resources nor is there any indication that we will receive funding from a ‘contractual or tuition-fee basis,’” Carman stated. “As a school district, fundamentally, we felt legally and ethically obligated to provide the same quality educational services and resources that we would afford to any student that resides within our district, regardless of their immigration status,” Carman stated. As part of the program, the district assigned 19 teachers, an assistant principal and a counselor to teach about 438 children at the Southwest Key shelter. A teacher who asked that her name be withheld said the district hired teachers to replace those assigned to the Southwest Key program. Friday, Carman stated a spike in enrollment brought more students into the district this year. Under state law, the district is required to provide education to children ages 5 to 21 who live within its boundaries, the district’s agreement with Southwest Key states. The U.S. Immigration and Customs Enforcement requires school-aged children housed in shelters to have their educational needs assessed within three days of arrival, to receive six hours of structured instruction on weekdays and to receive special education services if they are eligible. Fernando del Valle is a Reporter for the Valley Morning Star. He can be reached at fdelvalle@valleystar.com or (956) 430-6278.